Golden brown baked tofu is infused with Southeast Asian flavors. The ginger-cilantro pesto is also great on pasta, fish and in soup. To prepare tofu, preheat the oven to 375°F. Toss the cut tofu with the tamari to evenly coat, and place on a prepared cookie sheet. Bake until golden brown, approximately 35-40 minutes, turning tofu occasionally to ensure even browning. Remove from oven and cool. To prepare pesto, add all ingredients to a blender or food processor and puree until smooth. Add oil if needed to thin the pesto. 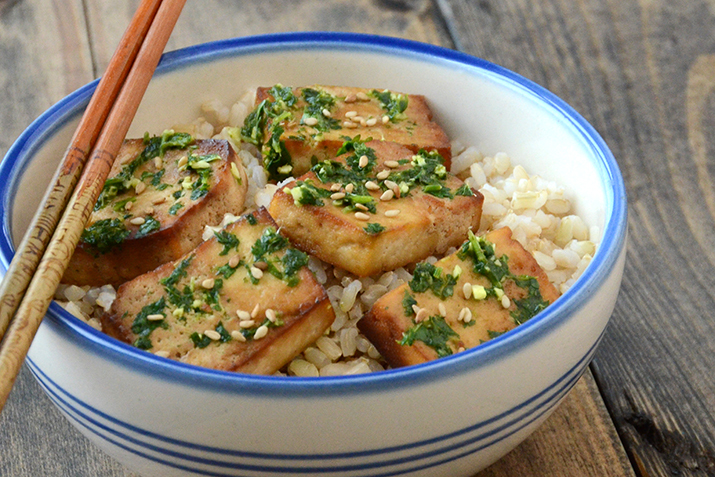 Toss the cooled tofu with the pesto and sesame seeds to coat.